These cool new Huge Rustic Clothespins hang on your wall, not your clothesline (unless you're drying clothes for a fairy tale giant), and are perfect for decoratively holding up towels, photos, drawings, notes, magazines, or whatever you'd like. 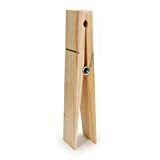 Each giant 12 inch clothespin is hand-stained in a dark walnut finish and then varnished, plus there's a handy brass plated tooth hanger on the back for hanging and each can be personalized with a name as well. Additional sizes and finishes are also available. Set Of 3 Extra Large Clothespins, Rustic Giant 12"